AP ICET 2019 Question Papers, Preliminary Keys @ http://sche.ap.gov.in/ICET: The answer keys, response sheet and question papers for the Andhra Pradesh Integrated Common Entrance Test 2019 (AP ICET) have been released on official website sche.ap.gov.in. AP ICET 2019 was conducted by Sri Ventakeswara University, Madurai on behalf of Andhra Pradesh State Council of Higher Education (APSCHE). The examination was held on May .. and the results will be declared on May .., 2019. Step 1: Open the above-mentioned official website. Step 2: Click on ‘Exam Papers & Preliminary Keys’. Step 3: A file will open which would have answer keys. Step 4: Download it for future reference. Andhra Pradesh Integrated Common Entrance Test is a state-level examination and admission to various colleges across the state are done through it. 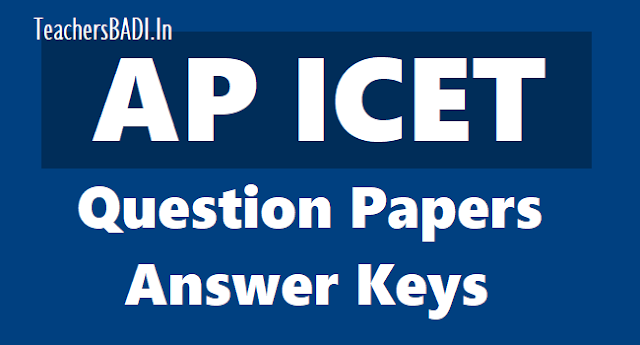 AP ICET helps a candidate to get admission to courses like Master of Business Administration (MBA) and Master of Computer Application (MCA). Candidates having any objection to the preliminary answer key can submit his/her query by May 6, 2019. AP ICET 2019 Result will be accessible through online modCandidatesaes who would crack the exam will be invited for counselling, which is must for getting admissions into colleges. Candidates who appeared for the exam were supposed to have a Bachelor Degree from a recognised university. The candidates who get 25 per cent qualifying marks in APICET (50 out of 200) and candidates belonging to the category of SC and ST to whom qualifying marks have not been prescribed, shall be assigned the rank in the order of the merit on the basis of marks obtained in ICET.